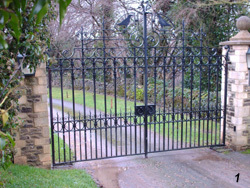 Work as normal swing gates yet each leaf is halved by hinging each leaf in the centre of the panel. They have the big advantage of a reduced radius of swing of the gate when opening into a limited parking spot i.e. the front yard of a house. Ideal for controlling traffic flow into areas such as car parks. No restriction to pedestrians, yet a deterrent to vehicles. Can cover up to 6 metre spans with one boom. Boom rotation time is very short compared to a swing gate. Many Strata title and industrial sites require a specific approach. Multiple users, together with the need for security, demand specific control equipment, special gate design and gate opening equipment. A realistic option when installation of power to a particular site is difficult and costly. The solar cell requires an open area without shade to maximise the advantage of the sun's energy. The solar aspect does have a significant cost depending on the individual requirements.